The New, Narrow and Natural Screen of Choice! 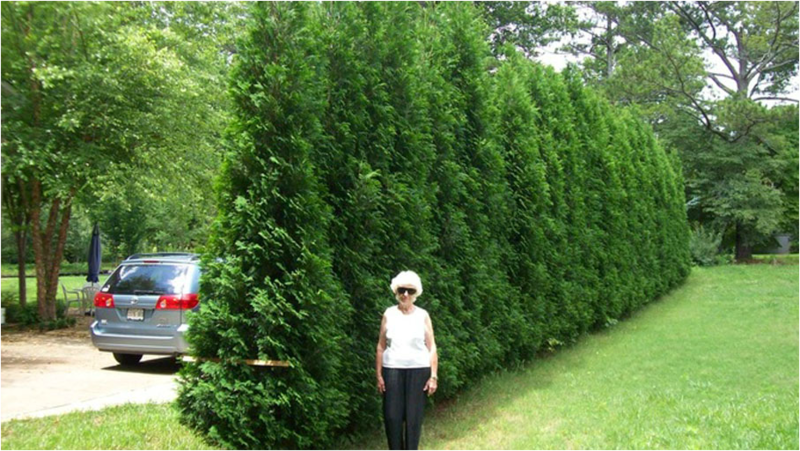 The American Pillar Arborvitae (the original sport* shown at the left), grew to 21 feet tall and only 4 feet wide in 7 years from an 18” plant in a field of 500 ordinary Thuja Arborvitae. * A sport in botanical Terms, is a plant that because of a mix-up of its genes or similar accident is significantly different than its parent. 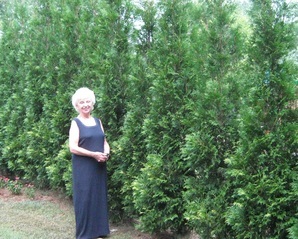 Most of the better cultivars of our better ornamental shrubs, trees, fruits, etc. originated as sports. The “American Pillar” is the result of one such beneficial event. Our U.S. Plant Patent is # USPP20,209 P2. The American Pillars were spaced at 24" intervals and were approximately 4 feet in height. 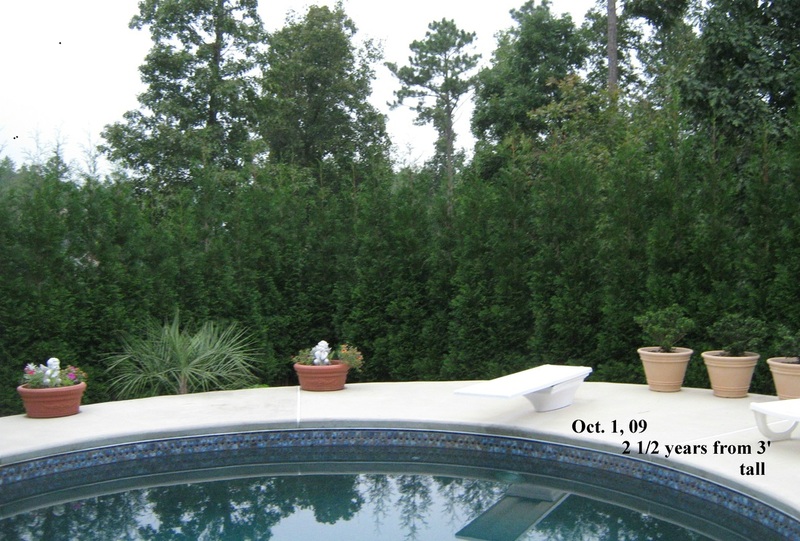 2 1/2 years later The American Pillars stand at approximately 9-10' tall and just under 3 feet wide in picture at below. just 5 years after planting the original 4 foot tall trees. 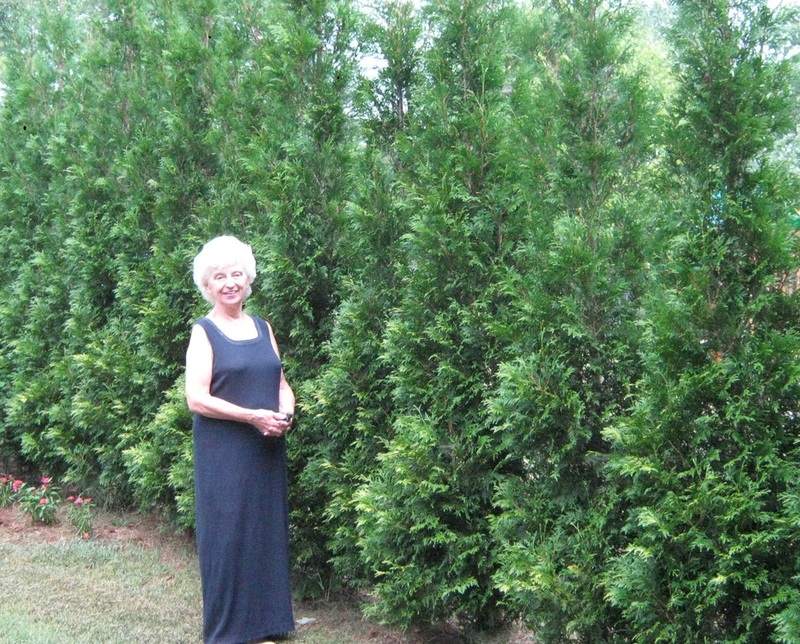 As patent developer of the new American Pillar Arborvitae, the late John Houser was a propagator, nurseryman/grower, installer, and promoter of the "American Pillar" Arborvitae. This is a new cultivator with the unique ability to rapidly grow very tall and dense, while remaining very narrow. The American Pillar fills a real need with homeowners, residential and industrial builders. We know of no other plant that has the ability to grow so tall, dense and rapid, while maintaining its very narrow stance. 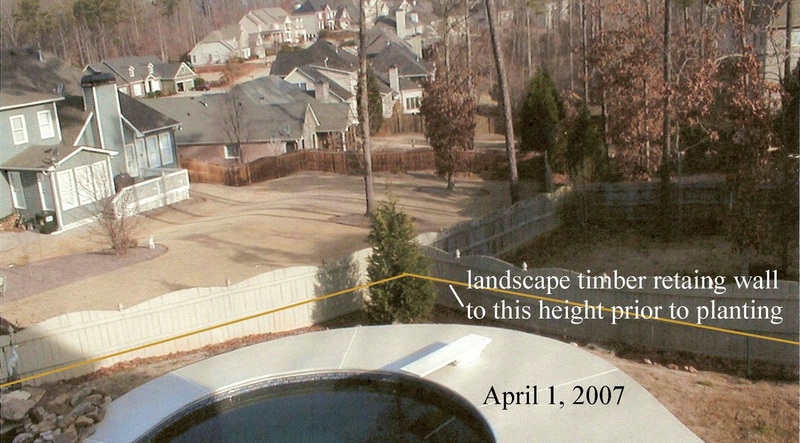 In an era of larger houses on smaller lots, this evergreen will, in a short time, achieve privacy for back yards, swimming pools, and yes, even second story decks! busy streets without spreading wide and eating up valuable space, walkways and driveways. 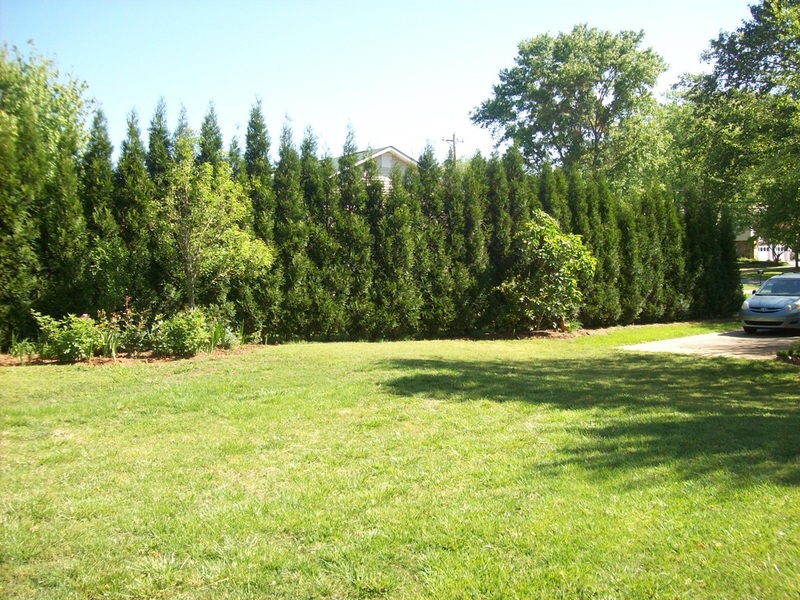 It cost less overall than a wood fence or any other tall plant screening. 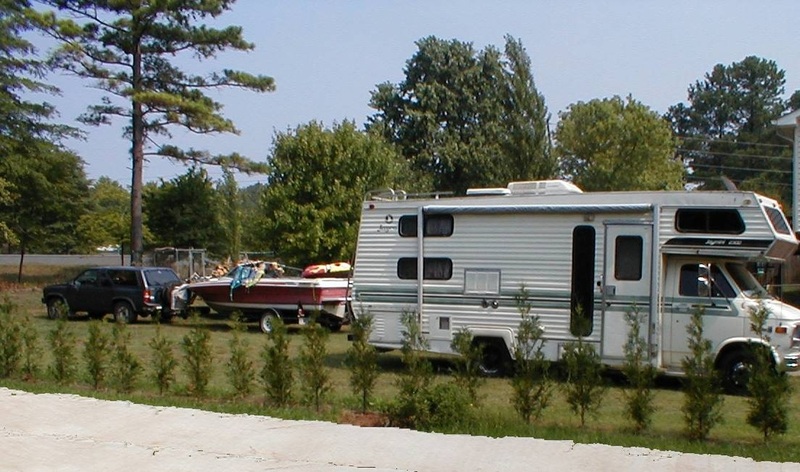 *Many board fences are in need of replacement or of continued costly maintenance during a ten year period. Consider the beauty of an "American Pillar" screen! FAQ: How long will they live? Longer than you or I. The oldest living specimen of the specie (parent of American Pillar) is over 500 years. FAQ: How tall do they grow? Approximately 3 feet a year after the first year. Very rapidly until they reach 20 to 23'. After that, slower, ultimately 30'. Some people top them off for a hedge at 10' to 16' which slows their growth markedly. FAQ: Won't I still need to have a board fence for my dog? You can make the American Pillar screen fence a dog, child, and even deer by adding a welded wire fence right next to the screen. The wire fence is very inexpensive and soon enough, totally invisible! FAQ: Do I need to shear/trim them? NO. Very little, if any maintenance is needed to keep the slender columnar shape of the American Pillar.